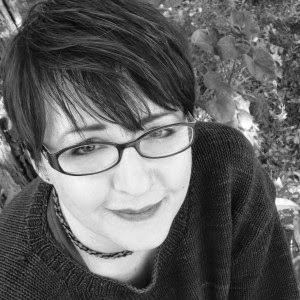 The Best Books Ever: Blog Tour ~ Now That You're Here by Amy K. Nichols ~ Review (by Jaime!) and Giveaway! 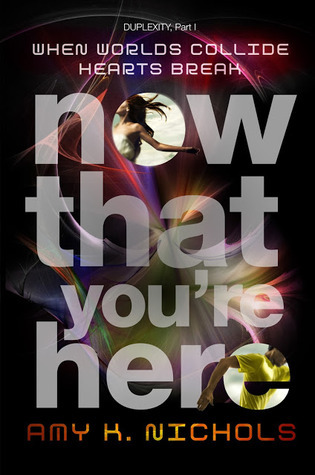 Blog Tour ~ Now That You're Here by Amy K. Nichols ~ Review (by Jaime!) and Giveaway! I am a happy book lover lately. Not that I'm ever unhappy to be a book lover, but slumps happen, bad books in a row happen, and it can get very frustrating. Lately, with one exception, I have been having great luck. Thankfully, that streak continues with Now That You're Here. Hence, I am a happy book lover! Eve Solomon and her best bud Warren are physics geeks. the search for geocache's, they talk physics and Star Wars and Elvish and Clingon. After school and weekends, they hang out with Mac, the physics teacher at their school, and talk physics and help him with welding projects. They live in Phoenix, Arizona. Danny Ogden is a street artist, working for Red December with his best friend Germ. Danny went to an art exhibit and was kissed by Eevee. He lives in Phoenix, Arizona. One day in class, Eevee is startled when Danny bolts upright in his seat and gasps for air. He looks at her, startled, before running out of the classroom. That night, he winds up at Eevee's house, broken and bruised, begging for help because she is the only person he knows. What he tells her makes her think he is a lunatic, but then.... something is different about Danny. Could he be telling her the truth? Now That You're Here is told in alternating POV's, Danny and Eve. Eve and Warren are trying to figure out how to get Danny home. But is that really what Danny wants? Or Eve? Does it really matter what either of them want? This was such a fascinating story. I loved the physics lessons, and the geekery in the story. It made me smile every time Warren pulled out the Spock. It was interesting to watch Danny try to make this alternate Danny's life his own, and maybe make it better for him. I loved watching Eve and Danny getting to know each other, and seeing that friendship turn into the sweetest of romances. And it broke my heart knowing that their hearts might very well be broken. Now That You're Here was a fast-paced thrill, with seriously wonderful characters who were relate-able; who I rooted for from page one. The science was interesting and not too advanced so that everyone can understand what is happening, and what is being said. The romance was sweet and honest, and one that I can easily root for. Never once did I feel myself getting bored. As a matter of fact, I had to make myself put the book down to get something to eat or run errands. And as soon as possible, the book was back in my hands. I loved this story of parallel worlds, parallel people. The writing was fantastic and flowed beautifully. The world-building, while maybe a little sparse, was still done extremely well. The POV switches were done perfectly. I never once had a hard time identifying who was speaking. This story was wonderful, and I loved every minute. I hope to see news about a sequel soon! The ending was heartbreaking, but perfect as the set-up for a sequel! I would absolutely recommend this book to anyone! I seriously love it when I stumble upon geekery in a book!